Ben Dafoe, a young emergency-room doctor and part-time crime-scene consultant for the Seattle Police Department, is haunted by addiction. Two years earlier, a cocaine and crystal-meth habit claimed the life of his identical twin, Aaron. Now Ben walks onto the scene of a savage stabbing to find that the victim is his former fiancée, Emily Kenmore--another loved one who fell prey to drugs. Part of the carnage in Emily's bedroom is a single streak of blood caked on the wall. When the DNA from that sample matches Ben's, he becomes the prime suspect. Convinced his identical twin is still alive and somehow involved in Emily's death, Ben goes on the run, aiming to find Aaron. Working under an assumed identity at an inner-city clinic, Ben desperately searches for Aaron while playing cat-and-mouse with the authorities. But someone is determined to thwart his hunt at any cost. In the story's final twist, the truth hits closer to home and more lethally than Ben ever imagined. Daniel Kalla is the international bestselling author of "Pandemic" and "Resistance." He works as an emergency-room physician in Vancouver, British Columbia. 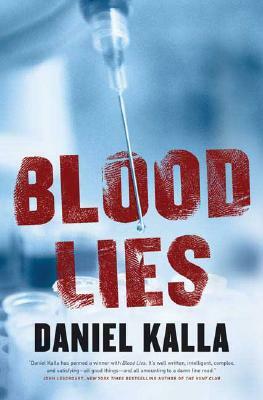 "Daniel Kalla has penned a winner with Blood Lies. It's well written, intelligent, complex, and satisfying--all good things--and all amounting to a damn fine read."